Big Gay Al returns to South Park, only to be thrown out as Scoutmaster to the boys for being gay. The boys rally to his defense, with the help of the new “handi-capable” kid, Jimmy. 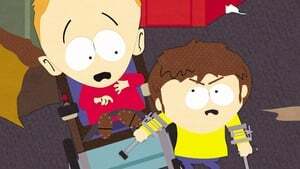 But there’s only room for one crippled kid in South Park, so Timmy and Jimmy throw off the gloves, as well as the crutches and wheelchair, in an all out slugfest to end all slugfests.